Full Renovation of the Plaza’s Second Floor! - Communication Plaza | Yamaha Motor Co., Ltd.
Full Renovation of the Plaza’s Second Floor! We have changed the focus from exhibits you look at to displays you “experience.” The Plaza’s previous 2nd floor History Space and Historic Model Display Area have undergone a dynamic renovation for the first time in 12 years to make displays easier to see and understand. By exploring the circular history corridor making full use of the building’s walls for content, the re-creation of the starting grid of a racetrack, and through sections collecting products from our history by category and era, you can learn and experience the company’s 60-year history from its founding in 1955 to the current day through a variety of exhibits, videos, sounds and informational displays for a truly enriching experience. You will find the areas are well suited for taking commemorative photos with the open spaces with good views all around. Please pay us a visit and bring your family and friends along! 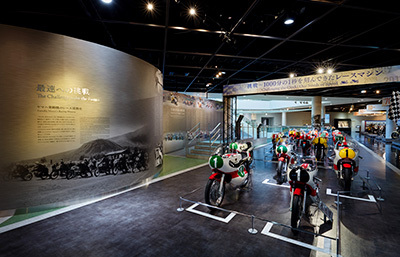 Corporate History Zone: This corridor is decorated to re-create the air of Japan’s period of rapid economic growth when Yamaha Motor was founded. Experience here the era when Japanese industry was absorbed in the excitement of creating new products with hopeful eyes to the future. Racing History Zone: Yamaha Motor’s progress has always gone hand-in-hand with our ceaseless challenge in the racing arena. The passion and technological advances are dynamically presented with the image of a racetrack starting grid. 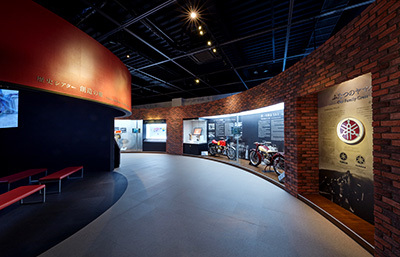 Product History Zone: Our historic motorcycles are displayed in a section for each era, while our marine products, recreational vehicles and 4-wheeled products are all displayed in their own separate sections for a flexible layout.